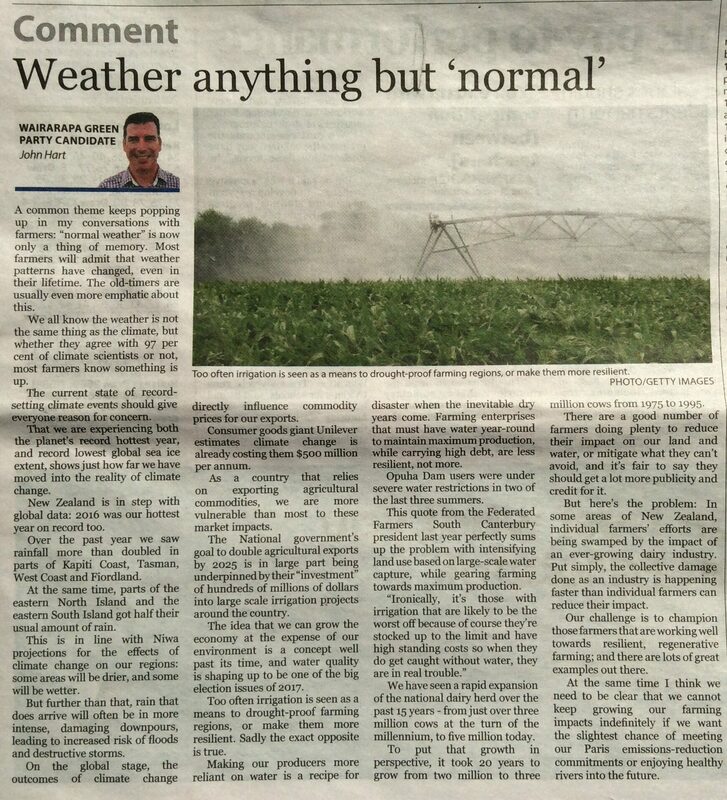 A common theme keeps popping up in my conversations with farmers: “normal weather” is now only a thing of memory. Most farmers will admit that weather patterns have changed, even in their lifetime. The old-timers are usually even more emphatic about this. We all know that the weather is not the same thing as the climate, but whether they agree with 97% of climate scientists or not, most farmers know something is up. The current state of record-setting climate events should give everyone reason for concern. That we are experiencing both the planet’s record hottest year, and record lowest global sea ice extent, shows just how far we have moved into the reality of climate change. New Zealand is in step with global data: 2016 was our hottest year on record too. Over the last year we saw rainfall more than doubled in parts of Kapiti Coast, Tasman, West Coast and Fiordland. At the same time, parts of the eastern North Island and the eastern South Island got half their usual amount of rain. This is in line with NIWA projections for the effects of climate change on our regions: some areas will by dryer, and some will be wetter. But further than that, rain that does arrive will often be in more intense, damaging downpours, leading to increased risk of floods and destructive storms. On the global stage, the outcomes of climate change directly influence commodity prices for our exports. Consumer goods giant Unilever estimates climate change is already costing them $500 million per annum. As a country that relies on exporting agricultural commodities, we are more vulnerable than most to these market impacts. The National government’s goal to double agricultural exports by 2025 is in large part being underpinned by their “investment” of hundreds of millions of dollars into large scale irrigation projects around the country. The idea that we can grow the economy at the expense of our environment is a concept well past its time, and water quality is shaping up to be one of the big election issues of 2017. Too often irrigation is seen as a means to drought-proof farming regions, or make them more resilient. Sadly the exact opposite is true. Making our producers more reliant on water is a recipe for disaster when the inevitable dry years come. Farming enterprises that must have water year round to maintain maximum production, while carrying high debt, are less resilient, not more. Opuha dam users were under severe water restrictions in two of the last three summers. This quote from the Federated Farmers South Canterbury president last year perfectly sums up the problem with intensifying land use based on large-scale water capture, while gearing farming towards maximum production. We have seen a rapid expansion of the national dairy herd over the last fifteen years – from just over 3 million cows at the turn of the millennium, to five million today. To put that growth in perspective, it took twenty years to grow from two million to three million cows between 1975 and 1995. There are a good number of farmers doing plenty to reduce their impact on our land and water, or mitigate what they can’t avoid, and it’s fair to say they should get a lot more publicity and credit for it. 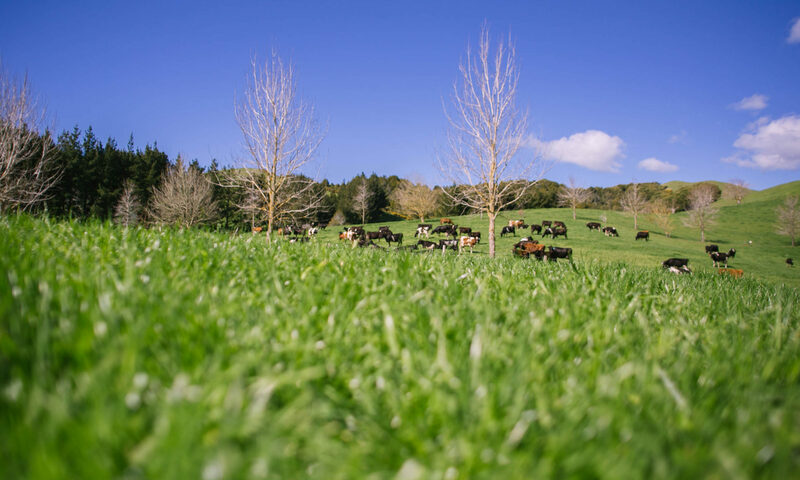 But here’s the problem: In some areas of New Zealand, individual farmers’ efforts are being swamped by the impact of an ever-growing dairy industry. Put simply, the collective damage done as an industry is happening faster than individual farmers can reduce their impact. Our challenge is to champion those farmers that are working well towards resilient, regenerative farming; and there are lots of great examples out there. At the same time I think we need be be clear that we cannot keep growing our farming impacts indefinitely if we want the slightest chance of meeting our Paris emissions-reduction commitments or enjoying healthy rivers into the future.